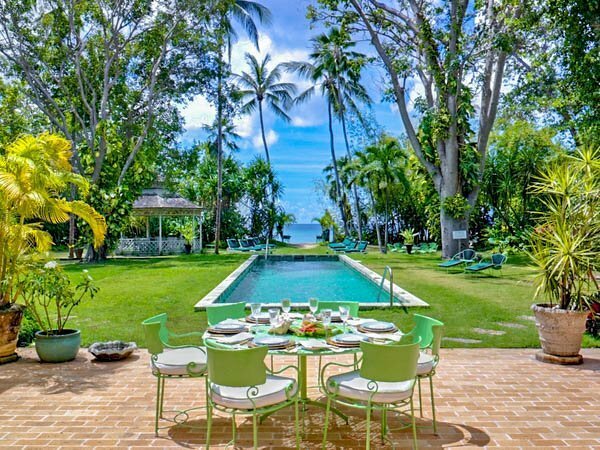 Highly regarded as one of the most exceptionally designed homes on the island, let Villa Nadra welcome you to the wonderful West Coast of Barbados. The garden is similar to a botanical garden with various exotic plants, flowers and shrubs. The booming surrounding nature makes for a pleasant and peaceful stay. One of the best features of the outside space is the large rectangular pool in the middle of a luscious green lawn. Here, you can go for a swim while looking out onto the horizon and then going for a dip in the vivid turquoise Caribbean Sea. By the pool lies a sizeable octagonal gazebo with a Chinese design, complete with lounging furniture and a small coffee table. The gazebo was designed by architect Larry Warren and seats up to fourteen people. It is conveniently equipped with a wet bar and fridge. You will really be able to take in your stunning surrounding environment at this spot, whether that's through quiet meditation or a glass of wine with a friend or loved one. The villa has been most recently renovated to fuse classic Palladian architecture with modern and contemporary appliances and amenities, all directed by architect Brian Surfleet. Inside, stone walls and tiled floors decorate the living spaces, as well as artistic ornaments, sculptures and fine art emblazoned onto the walls. Some of the most striking features in the home include a glass-topped table and French antique chairs in the dining room that is lit up by candlelight only. To find entertainment in the evenings you won't even have to leave the villa. If you fancy a night in, head to the media room which comprises of a 55” flat screen television with surround sound and a diverse library of over 400 DVD's. During your stay, you will be treated very well. An on-site team including a butler, cook, housekeeper, laundress, two gardeners and a night watchman will ensure that you have everything you need and desire, giving you the keys to ultimate relaxation. Villa Nadra is an incredibly impressive Bajan villa that can sleep up to 12-guests. With strikingly decorated North and South Wings, this is a holiday home that you and your family won't want to leave. While staying at Villa Nadra, you will have access to the swimming pool and sunbathing deck at The Beach House Restaurant. The restaurant itself is definitely worth visiting for a night of dining in front of spectacular views. Located on the prestigious Platinum Coast, the venue is open from morning until night, but it's the luminous sunset that provides the best backdrop and time to visit the restaurant. It's best to dine here at twilight when you can really hear the sounds of the gentle ocean rolling in. The eatery is famed for its fresh fish of the day and fantastic cocktails. This incredible home is in an ideal location to enjoy all that the island has to offer. Guests of Villa Nadra are welcome to use the numerous facilities at Cobblers Cove Hotel. The hotel is situated just a short walk along the beach and is a delightful and sophisticated family-run business. Inside, the building boasts a charming design and a relaxed ambience. Guests will enjoy the tennis court, a gym and spa services, available at a small price, as well as water sports on the beach. Archer's Hall Design Centre is located nearby Villa Nadra and houses a range of original West Indian pieces in its 17th Century showroom. The centre was created in 2003 and stocks pieces of furniture that you'd be hard-pressed to find anywhere else. From florals, lamps and artwork to picture frames, vases, dining table accessories and even gifts, you're bound to discover something that you just can't say no to.